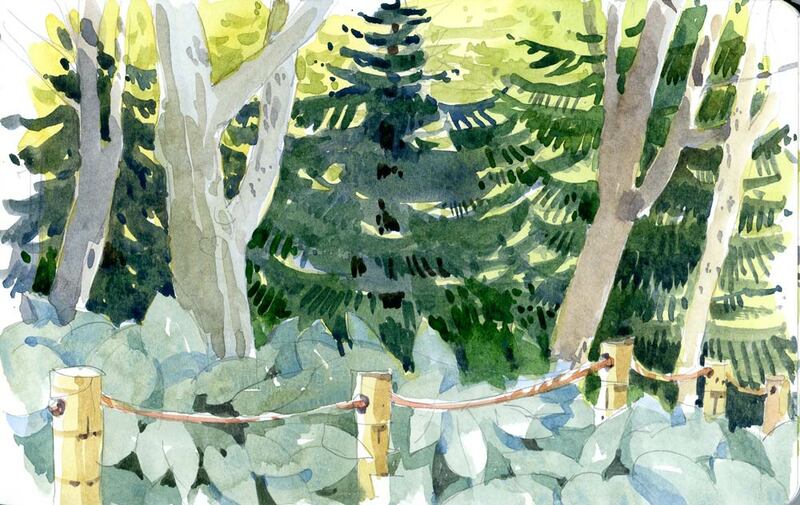 I picked this little area at the Botanical Gardens because it was the reverse of the scenes I usually draw. Most of the time the dark green trees are in the background and the grass in the foreground is light. But sitting on the hill in the Chinese garden, I looked through the dark layer of trees to the sunlight foliage beyond. 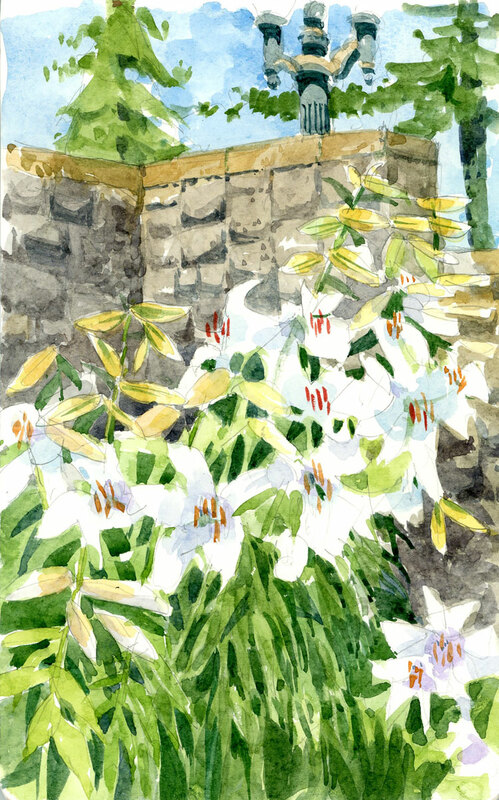 The hosta in the foreground is mostly a wash of cerulean blue with few darks added in later. My friend George loves kites, windsocks, flags — I guess just about anything that flutters in the wind. He packs a kite with him when he travels and he usually flies the national flag of the most current Formula One winner (he’s a racing fan too!) on his house. I wasn’t surprised when I saw this windsock flying from a pole on his dock. I’ve been trying something new lately — something that I tried and liked in Santo Domingo — that I find works well for me. I’ve been experimenting with standing instead of sitting while I draw. 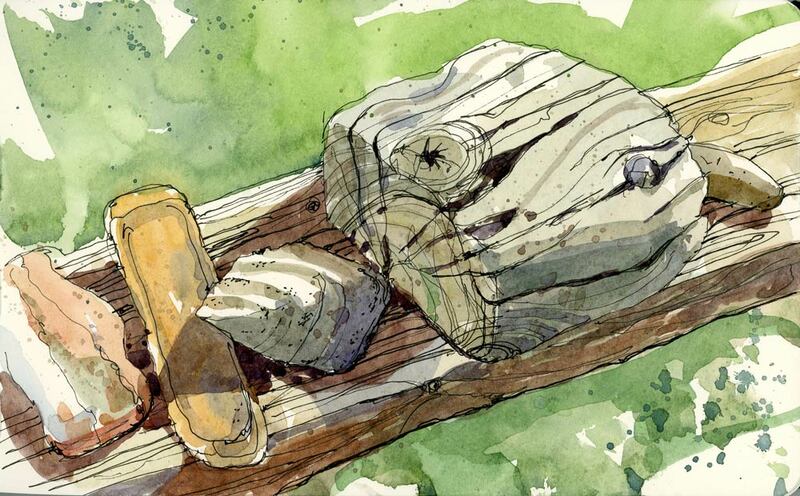 It worked really well in the market when I was doing people sketching because there’s a looseness and a freshness that I somehow can’t obtain while seated. Now that I’m home I’ve been trying it too. For this sketch (done in my Moleskine) I stood up to draw (and even to paint) and I’m happy with all the splats and backruns that I got because I wasn’t getting finicky with the details like I usually do when I am seated. Cable and satellite dishes have rendered these creatures obsolete but they can still be found on some old houses, hovering like big skeletons in the sky. Today is the first day of the Autumn semester for many CEGEPs in Quebec so that means back to school for me and for my students. This year I’ve decided to change the way I teach Adobe Illustrator by incorporating drawing in a sketchbook as part of the course curriculum. I think that having students draw every day will really help them conceptualize their ideas.Their reactions were mixed when I announced this — some love to draw but others looked a bit horrified and that’s understandable. I’ve given them some ideas of what they can draw and I thought that I would draw with them (you may occasionally see these on the blog). 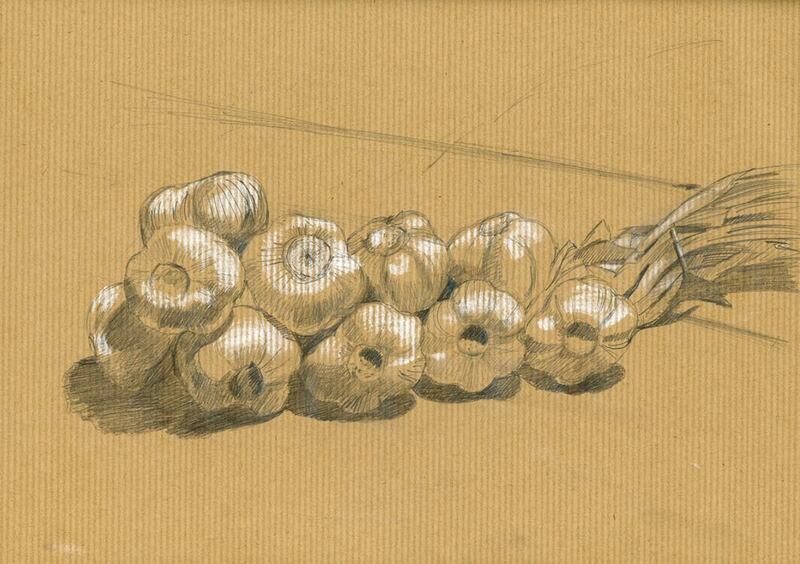 This week’s subject is to draw an object from your house so I picked this garlic braid and used pencil and white conté on Kraft paper from a pad I bought in Paris. The pad and the conté have both been sitting on my desk for months while I focussed on painting but it really does feel great to spend some time looking at an object — really looking at tones and shadows — and not thinking at all about colour. 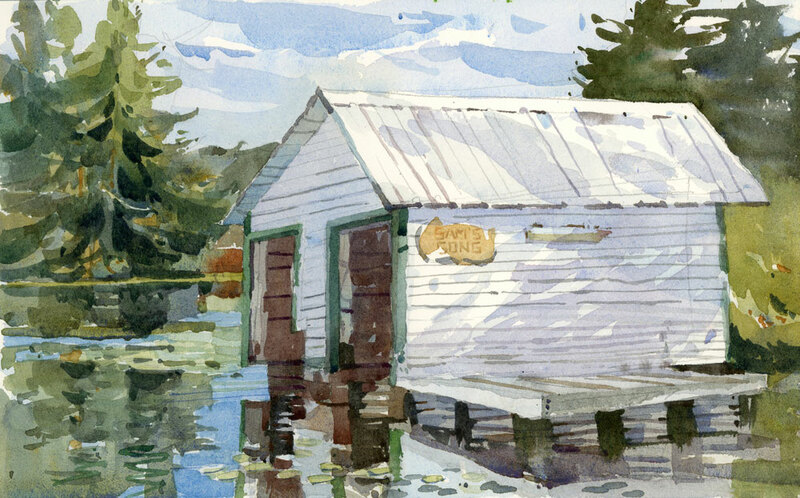 This boathouse is situated on a narrow channel between two lakes so the water is always pretty calm. I have taken many photos of this but never painted it and now I know why. When the water is this calm it’s a mirror! And the reflections are damn hard to paint!! A few ducks swam by but that wasn’t really enough to make things easier for me. You can never count on those birds.